This is a quaint little church but one of the most visited one in Fort Kochi. It is simple in architecture and looks neither grand nor indulgent. But once you enter it, it transports you to a bygone era. Plus the interiors tell us a very different story from what the exteriors do in terms of its importance in history of Christianity in India. The church once housed the remains of Vasco da gama, a Portuguese navigator and will be linked to him for eternity. 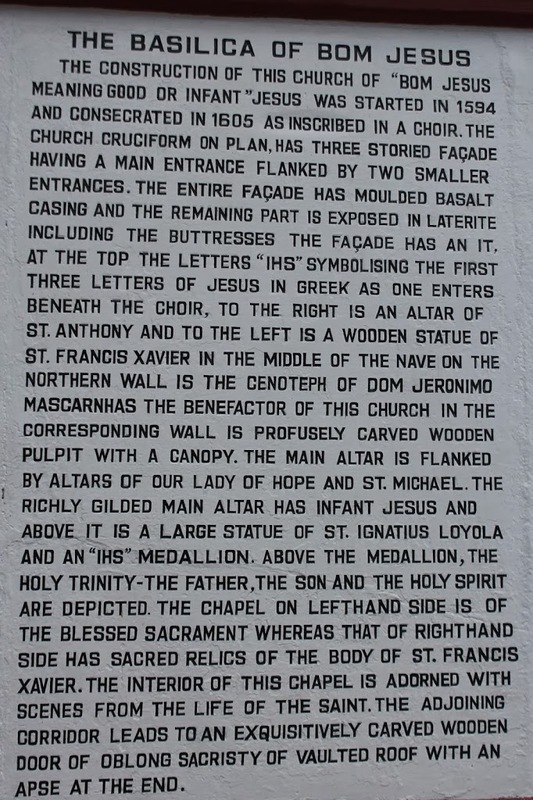 The plaque on the outside of the church had the following information about its history and origin. 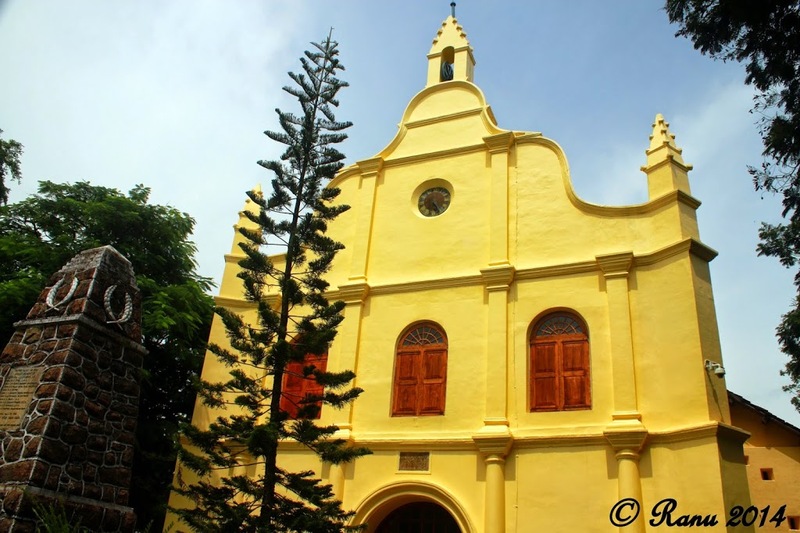 St Francis Church was the first European church to be built in India within the oldest European settlement of fort Cochin. Presumably it owes its origin to the Franciscan friars who accompanied the Portuguese expedition in 1500 AD. Originally it is said to have been erected of wood but later rebuilt in stone and roofed with tiles by 1516 AD and dedicated to St Anthony. 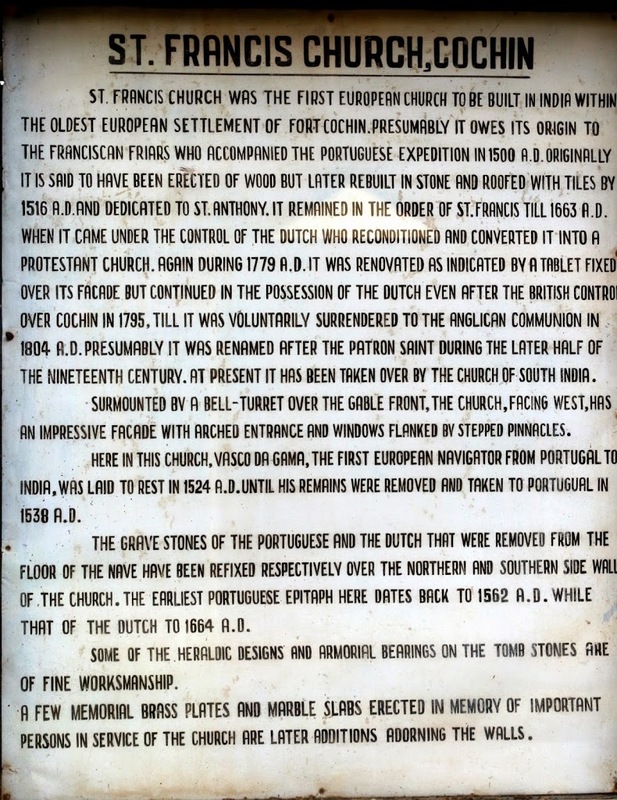 It remained in the order of St Francis till 1663 AD when it came under the control of the dutch who reconditioned and converted it into a protestant church. Again during 1779 AD it was renovated as indicated by a tablet fixed over its facade but continued in the possession of the dutch even after the British control over Cochin in 1795. Till it was voluntarily surrendered to the Anglican communion in 1804 AD. Presumably it was renamed after the patron saint during the later half of the 19th century. At present it has been taken over by the church of south India. Surmounted by a bell-turret over the gable front, the church, facing west, has an impressive facade with arched entrance and windows flanked by stepped pinnacles. 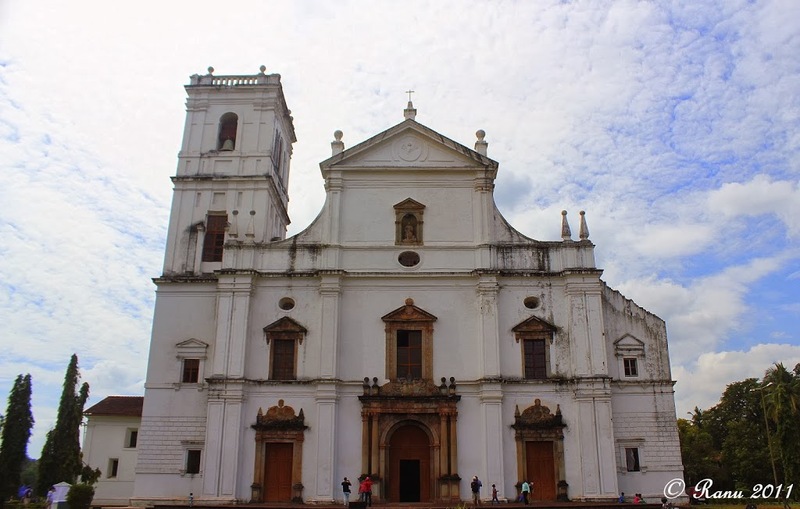 Here in this church, Vasco Da Gama, the first European navigator from Portugal to India, was laid to rest in 1524 AD until his remains here were removed and taken to Portugal in 1538 AD. Some of the heraldic designs and armorial bearings on the tomb stones are of fine workmanship. A few memorial brass plates and marble slabs erected in memory of important persons in service of the church are later additions adorning the walls. 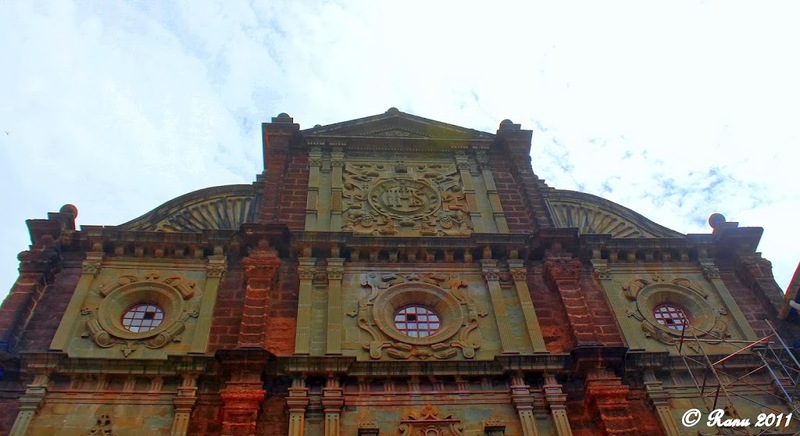 St. Francis Church is one of the oldest European Churches in Kerala. It is a major landmark on Fort Kochi which was built in the 16th Century AD. 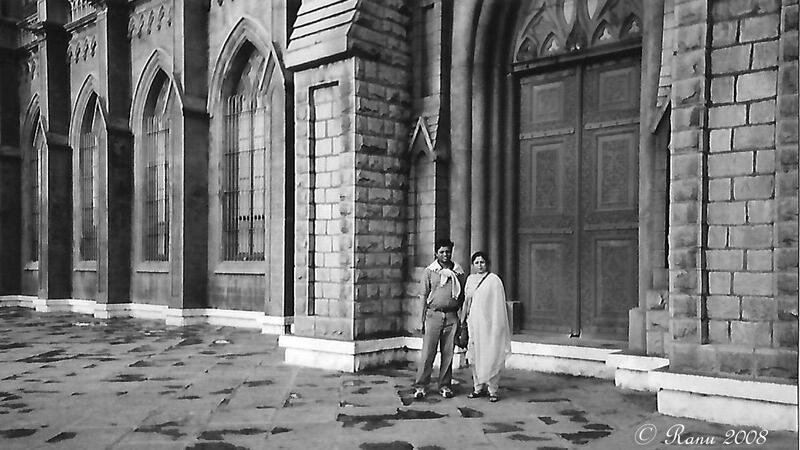 The history of this church reflects the colonial struggle of the European powers in India from 15th to 20th centuries. The flood in Periyar during 14th century changed Kochi as a natural harbour and the marine trade become prolific along with KozhiKode and Kannur. The arrival of Portuguese navigator Vasco Da Gama in 1493,the foreign supremacy over India. The Portuguese Commander Admiral Cabral visited Kochi in 1500 AD and Unni Ramakoil, the then Rajah of Kochi pepermittedim to trade here. In 1503 AD Alphonso Albuquerque was given permission by the Rajah to build a fort at the mouth of the river. 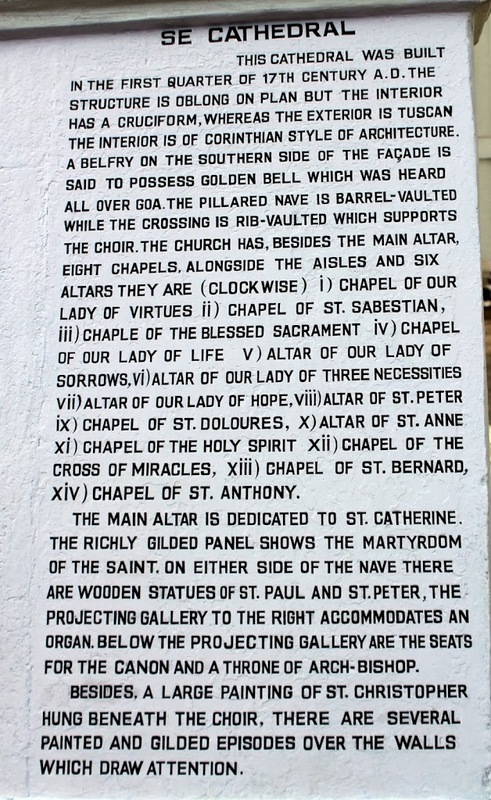 The five Friars who accompanied Albuquerque to Kochi in 1503 AD, erected a wooden church dedicated to St. Bartholomew within the temporary fort made with mud and bamboo. Later on the church was rebuilt in stone and tile roofed. The Franciscans raised the present edifice, in the name of St. Anthony in 1516 AD. The first Portuguese navigator, Vasco da Gama’s mortal remains was buried in the church. Later on his son Pedro da Silva da Gama took his mortal remains back to Portugal in 1538 AD. The east facing Church has an impressive frontage that reflects the typical Portuguese style. 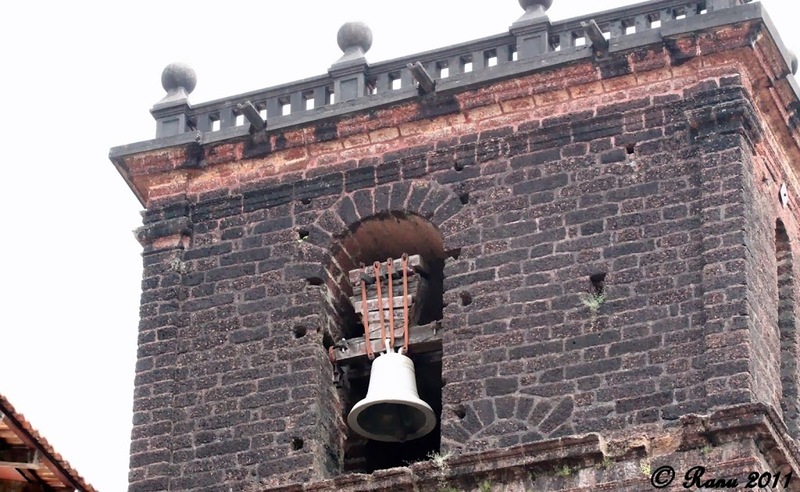 The facade with an arched opening and one of the tiers has flanking windows, a bell fry over the gabled front and steeped pinnacles on sides. From 1510 AD to 1663 AD the Portuguese officially called St Francis Church as the conventional church of the order of the St Francis of Assisi. The Dutch made changes in name and structure of this Church and did some major restoration works in 1779 AD. After the advent of the british it was the government Protestant church from 1619 – 46 AD. 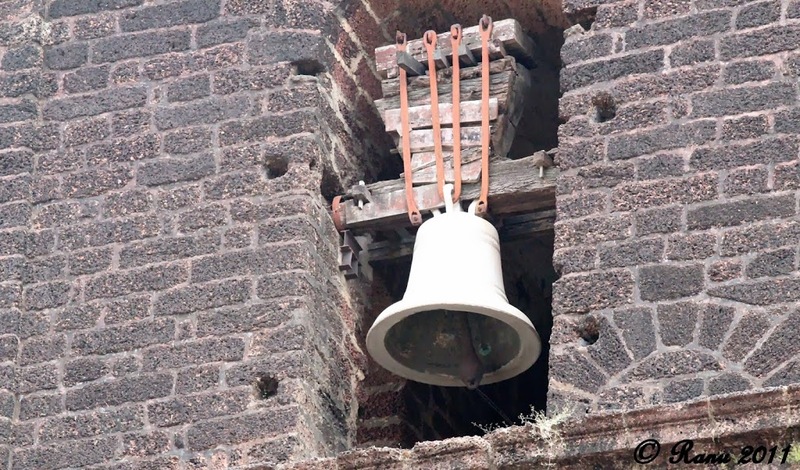 However, this church was known by the names St Francis only after the substantial restoration and renovation carried out by the British in 1886 – 87 AD. This is a centrally protected monument under the control of the Archaeological Survey of India since 1923. This white building is the Se Cathedral. The cathedral is dedicated to Saint Catherine more details in the lower pic. I found this church particularly peaceful especially the statue of Jesus which graced the lawn in front of the church. A visit to Goa is as incomplete without this monument as it is without its beaches. The Basilica also houses the sacred relics of body of Saint Francis Xavier. One of the iconic buildings in India. More details in the lower pic.